Recently I came across an article on facebook regarding lack of viability of investing in real estate by taking loans: the article went so far as to say Only Builders, Banks gain when you take loan to invest in Realty. As outlined in the outperformance matrix, Realty will outperform Fixed Deposits only if the appreciation in 5 years is greater than about 55%. There are assumptions about loan and fixed deposit rates - a tweak in those will impact the above matrix. However, the point to take home is that Real estate is worth the risk only if we see growth of >15% per year. Else, it is definitely not worth the price risk and liquidity risk. Simple and precise. 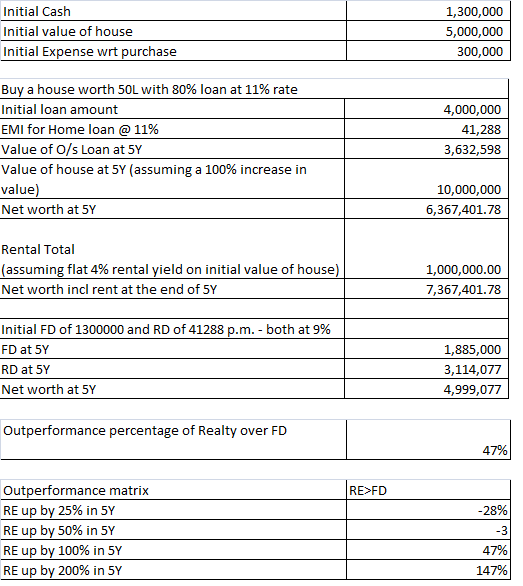 Anyone planning to buy a house should do this calculation before making a decision. Shouldn't tax saving be considered before computing the outperformance. I think it is all the more important to consider tax saving if it is a let out property. Selva, you should add the cost of property tax and maintenance charges to this. Definitely agree that not including tax angle makes this calculation incomplete. However, the tax benefits out of Interest paid would be more or less offset by Income tax on Rental, Capital gains tax and property taxes (if any). Hence, I would say the above table is a good estimate while including the tax numbers could make it more accurate.